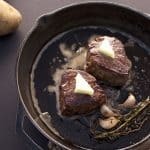 The perfect method for filet mignon. Nail it every time! Remove filets from refrigerator at least 20 minutes before cooking. Once near room temperature, season well on all sides with salt and pepper. Heat skillet over high heat. Once it begins to smoke a little, add oil. Then swirl around pan for about 15 seconds. Add filets to screaming hot pan and sear on all sides (top, bottom, and all around sides), 2-3 minutes each side. After the first turn, add butter, thyme, rosemary, and garlic to pan. Baste steaks constantly during the searing process. Transfer skillet to oven. Cook times - rare: 5 minutes; medium rare: 6 minutes; medium: 7 minutes; anything else: just don't. Halfway through cook time, turn steak for even cooking. Remove skillet from oven and transfer filet to plate to rest for at least 5 minutes before slicing.